the anatomy of an applique embroidery design! The Almond Silk Paisley collection has been great fun to create. I would like to take you through the embroidering process of one of the designs from the next set to be released from this beautiful collection which is proving to be very popular. I have chosen this design because it is one of the most complicated in this set, having the option of three appliques. As you know when I blog about my experiences I share my mistakes so you can learn from them and avoid them. I hope this will give you a few tips and the confidence to attempt this lovely design. 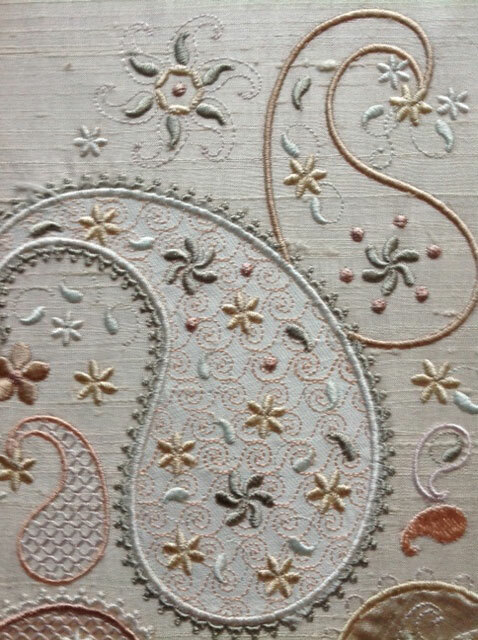 The designs are called Almond silk paisley so I choose an almond silk dupion to stitch it out and found small pieces of beige, pale pink and ivory silk for the appliques. I did not back it and used one layer of heavy stitch and tear to see how it coped with the appliques, and also because I have had this a while and need to use it up. I picked it up last year at a Dealer in Florida when I attended the American Embroidery Conference. It was unmarked so I do not know what brand it is. The design does some embroidery before the appliques are applied. 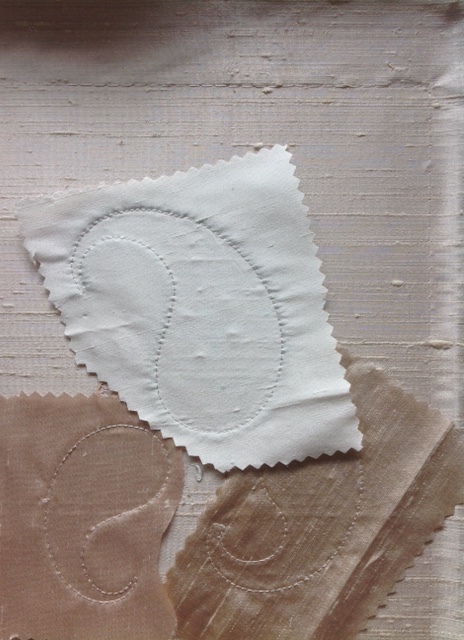 Here you can see I have laid the first piece of beige silk on the first applique. 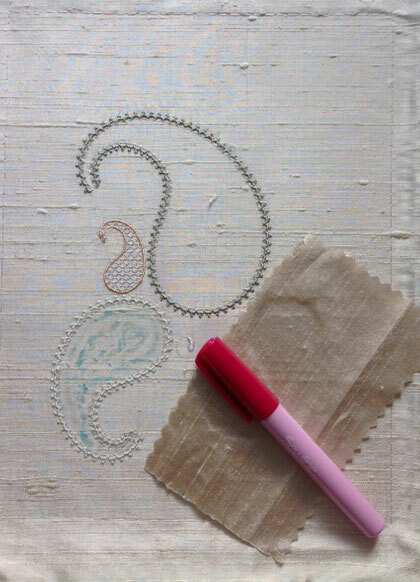 The blue marks on the smaller paisley are the glue from my Sewline glue pen shown, which I love to use. The blue turns clear after a while so it is perfect for this. Notice that I have laid the silk diagonally. Slubby silk is so easy to work with as the weave is bold and aids perfect alignment. Press the fabric into place with your fingers. 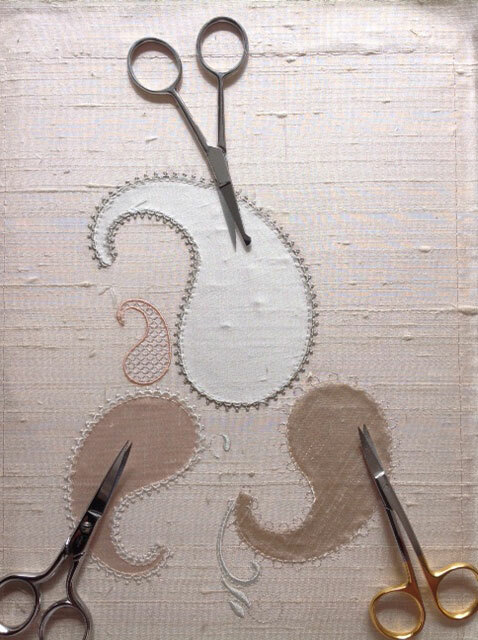 I have placed three pieces of silk dupion on the paisleys, making sure they do not overlap too much and get caught in the stitching process. If you slow your machine down you will be able to lift any fabric up as the paisleys are quite close to each other. 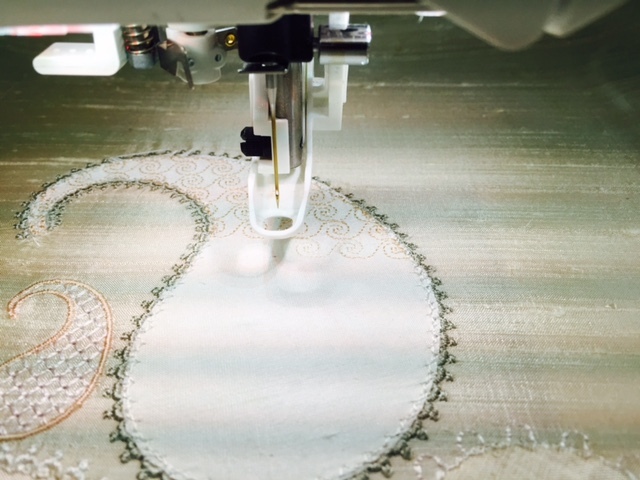 Remove the hoop from your machine to trim the appliques as it will be much easier for you. Keep turning the hoop around to help the cutting process. We have had some discussion in my Embroidery group about the use of applique scissors but I decided to use different scissors for each applique and see which worked best. The inner circle at the tip of the applique is the hardest part to trim close. 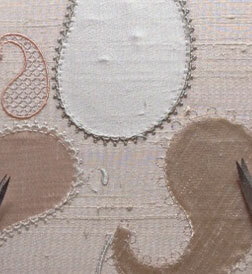 My designs are digitised so that you cut the applique fabric after it has been applied. From experience I find it best to have as much fabric as possible to hold up and away as I trim. The top applique was trimmed with my applique scissors and I was not able to get as close as I wanted with these. The blade with the paddle, goes underneath to hold the fabric away. The left hand applique was cut with my favourite embroidery scissors which are curved and the result was better. The right hand applique was cut with smaller embroidery scissors as it had been mentioned that some of my customers use cuticle scissors. These cut very close indeed. 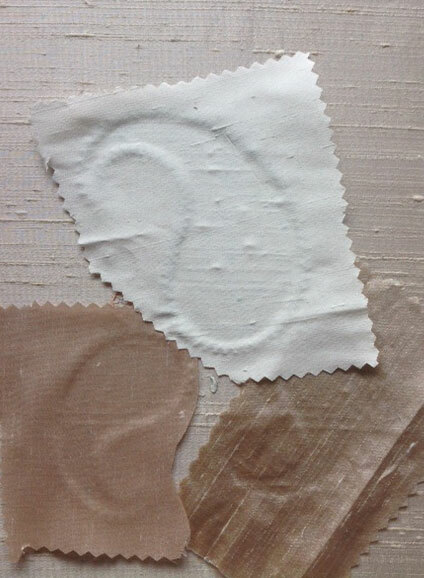 One of the benefits of using silk dupion is that its fraying tendency allows you to trim excess threads easily that protrude from your applique! However you may prefer to trim after the embroidery is done for a more frayed look. When I returned the hoop to my machine and continued with the embroidery, I noticed that my best cut applique was not laying flat because it had pulled out! The other two looked fine and by that time the blue glue had also faded underneath. 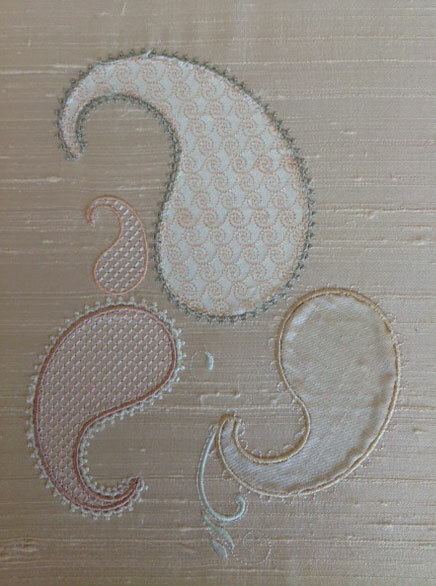 Here is a little tip if you thread breaks which happened to me with the motif fill in the large applique. 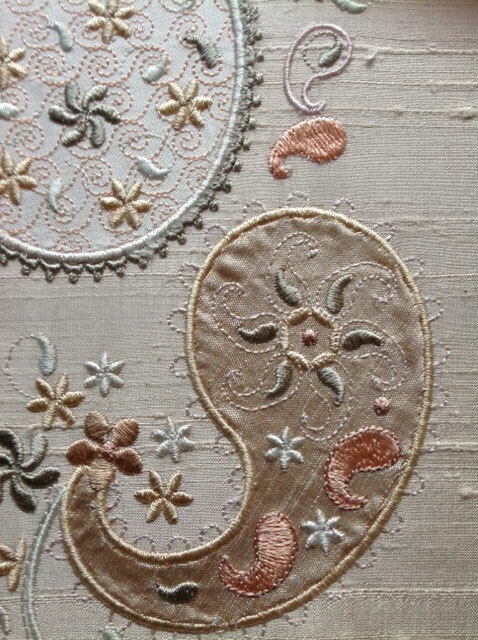 As you can see the thread started to fray so the colour faded on the motifs. 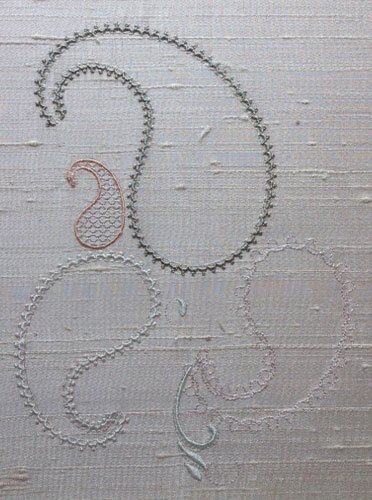 Once I had re-threaded it I moved the embroidery back to the edge of the applique so it looked bette, hiding the join. I confess that the thread may have been a little old and this happened twice, so I slowed my machine down and it did not happen again. A few more colours have been stitched. 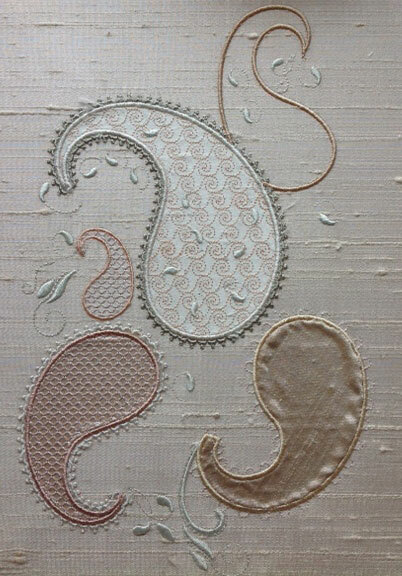 Here are sections of my finished design showing each applique. As you can see the really close trimming pulled out and spoilt the design somewhat. The other two were perfect. Obviously you may not choose to use the applique option on these designs, or may decide to do only one or two. 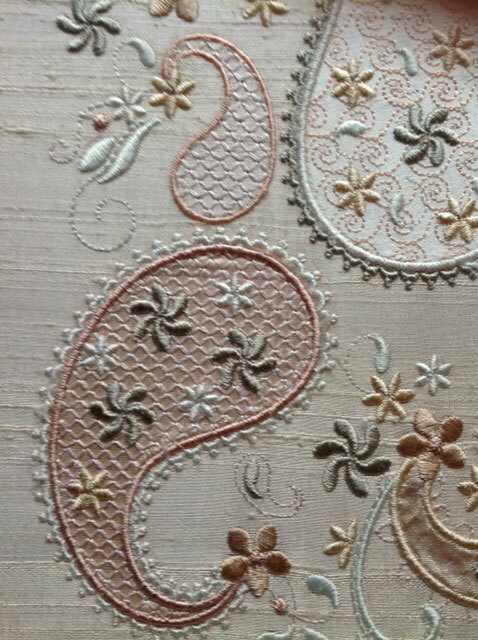 You do not need to eliminate the threads which secure the applique as they are hidden beneath the satin stitches. Watch out for the last set in this collection, Almond silk paisley 4 for 300mm x 200mm hoops, which includes some wonderful quilting blocks! This design from Almond Silk Paisley 3 for large hoops, 240mm x 150mm will be released around 10th July, 2015. 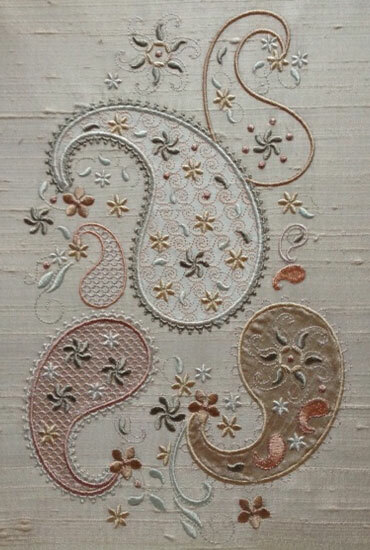 This entry was posted in Discussing machine embroidery, New Designs and tagged applique, machine embroidery. Bookmark the permalink. 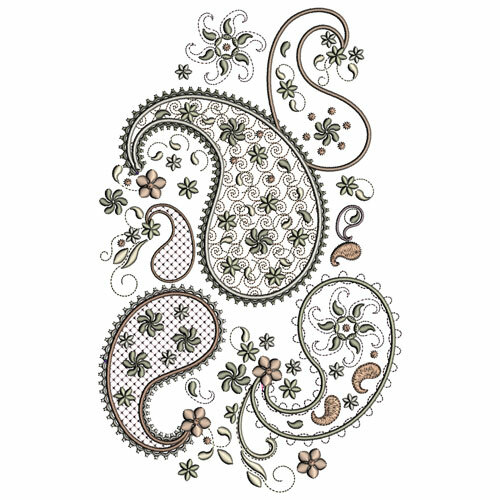 3 Responses to the anatomy of an applique embroidery design! I love this collection! We’ll be moving soon and when we do I’ll be redoing the bedroom. I’m hoping to use designs from this collection. All your designs are beautiful but this one is especially so. Thank you for doing such a wonderful step-by-step visual! The experiment with scissors & the “problems that popped up as you went encourages all of us, that even the “pro” has the same frustrations that we encounter. This collection is sublime!